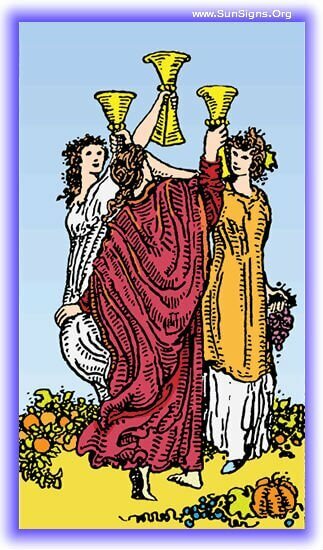 The Three of Cups is a tarot card of groups, it represents a gathering of friends or a work group teaming up on a project. It represents an abundance of joy in the Minor Arcana. It is multiplied by being shared with others, and a general sense of vitality and success. This Rider Waite tarot card represents a general sense of good times and joy in life. When the Three of Cups arrives in your life, it is a time to open yourself to helping others, and to receiving assistance from others. It represents that you have a strong support group around you. This signifies a time for you to spend more time with those groups. It’s time to take a breather from the struggles of life, and remember all the good that life has in it. Three of Cups upright stands for excellent luck in love. This card often symbolizes weddings. In your relationships, you have just completed the initial stage and much more is yet to come! You will craft a strong bond in a group or in your relationships. This is a time for you to celebrate. The celebration could be related to the welcoming of a new born in the family, a marriage or any other family event. You will be spreading good cheer amongst those around you. You will be guided by your intuition to come out of the veils of dilemma. You would be able to forget the unhappy past and move forward with optimism. A matter that was pending for a long time may finally come to a pleasant conclusion. This tarot card being in your past means you’ve been in good company, surrounded by friends and a wonderful support group. Whatever challenges or celebrations you’ve been going through, you’ve been doing it in the best of company! You may have lost sight of it, but fear not. You’ve got a wonderful support group near at hand, all you need to do is reach out for it. Your current struggle will be made easier with their company, and they’ll have ways of helping you cope you would not have come up with on your own. You may feel alone right now, but a support group is going to reveal itself in the near future that proves you are not. They’ll pick you up and carry you through right when you need it most, for now, just keep your head down and movin’ on. Don’t worry, they’ll be there when you need them. Yes, you will see your way through this. The people around you will serve as a support group to see you through. The Three of Cups inverted bears an unfortunate portent more often than not. When this tarot card arrives it almost indicates an affair of some sort in a romantic relationship. In a business relationship there are plans being made to undermine what appears to be the primary work force. When this isn’t the case it can represent a blockage in productivity or creative thinking caused by being isolated from outside influences. Groups generate creativity and ideas, especially in a business sense. 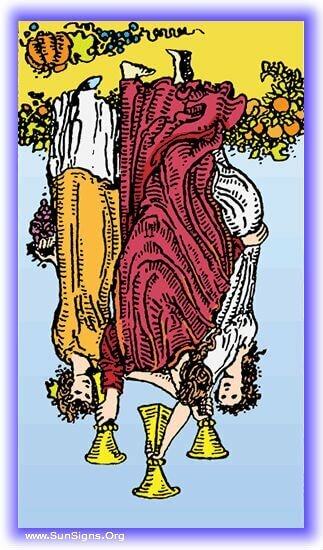 Three of Cups in the reversed position symbolizes a careless attitude along with a misuse of resources due to overindulgent nature. You will show excessive greed and will suffer from unhappiness and pain. You attitude would be pretty selfish and you are likely to hurt others by creating gossips about them. In spite of your sensuality, you are expected to have a physical relationship sans love and compassion with your partner. Some of your unknown talents will stay hidden for quite sometime. You have a tendency to suffer from illness because of smoking or eating excessively. You’ve been living in a vacuum these past few months, isolating yourself from friends and family. It’s had an effect on your mood, emotions, and creativity. You have friends out there that want to see you, stop it! What you fear is likely what is going on. Your partner is being unfaithful. They may not have acted on these impulses yet, but the fire is being stoked and they may be in communication with them. It’s time to sit them down and have a serious talk about your relationship and what can be done to salvage it. You’re in danger of pulling yourself away from your friends and relations. It may be that your current behavior is driving them away, and you’ll need to reconsider those actions before it becomes a permanent arrangement. There’s a saying “the one common denominator in all your relationships is you”. Maybe it’s time to start listening to their complaints. No, nothing good is going on. The situation may be just as bad as you fear, and communication will be necessary to sort out the details.